RAOUL IGNACIO "Iggy" RODRIGUEZ unveils his first solo exhibit of paintings and drawings at Blanc Compound Mandaluyong this November. KIMI IMIK is a palindrome, not only of letters but inevitably, of human conditions where the shifts between docile submission and the stirrings of reaction or even of resistance are placed in mutual confrontation. Within this space between reflections and deflections is the void where Rodriguez stages his metaphors. KIMI IMIK is a play on dreadful, as well as fantastic possibilities, which nonetheless belie its guttural call for resolution. 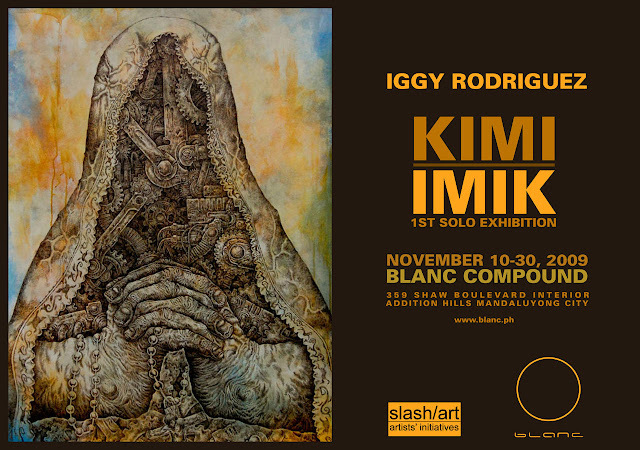 Iggy Rodriguez was named by the Cultural Center of the Philippines as Thirteen Artists Awardee in 2009. His art studies began as an advertising major at UST College of Architecture and Fine Arts. Known for his pen-and-ink drawings and the collaborative street art he undertakes with the artists' collective UGATLahi, Rodriguez crafts his imagings from his own milieu and calling as community organizer and activist. He is also a core member of TutoK. KIMI IMIK will run until November 30, 2009 and is co-produced by slash/art artists’ initiatives.